Win The Giver: The ultimate choice | SWITCH. Jonas is a young man who lives in a seemingly ideal, if colourless, world of conformity and contentment. Yet as he begins to spend time with The Giver, who is the sole keeper of all the community’s memories, Jonas quickly begins to discover the dark and deadly truths of his community’s secret past. With this newfound power of knowledge, he realises that the stakes are higher than imagined - a matter of life and death for himself and those he loves most. At extreme odds, Jonas knows that he must escape their world to protect them all - a challenge that no one has ever succeeded at before. 'The Giver' is based on Lois Lowry’s beloved young adult novel of the same name, which was the winner of the 1994 Newbery Medal and has sold over 12 million copies worldwide. 'The Giver' stars Australian Brenton Thwaites along side Meryl Streep, Jeff Bridges, Alexander Skarsgård, Katie Holmes and Taylor Swift, and is directed by Phillip Noyce. The 'The Giver' competition has now closed. Winners will be announced shortly. Competition opens at 5pm AEDT on Sunday 11th January 2015 and closes at 11:59pm AEDT on Sunday 18th January 2015. Five winners will be chosen at random on Monday 19th January 2015. To successfully win, entrants must fulfil the above entry conditions before the time the competition closes. Current members/followers are eligible to enter the competition. Only one entry per person. Only one winner per household. To be a valid winner, the entrant must not have won a prize from SWITCH within the last 28 days. 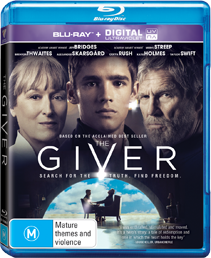 Each winner will receive one Ultraviolet Blu-ray copy of 'The Giver'. By entering, you agree to receive occasional emails from SWITCH in the future. If you decide to unsubscribe from these updates, any further entries will not be applicable. Only Australian residents are eligible to enter. 'The Giver' is available on Digital, Ultraviolet Blu-ray and Ultraviolet DVD on Wednesday the 14th January 2015 from Roadshow.